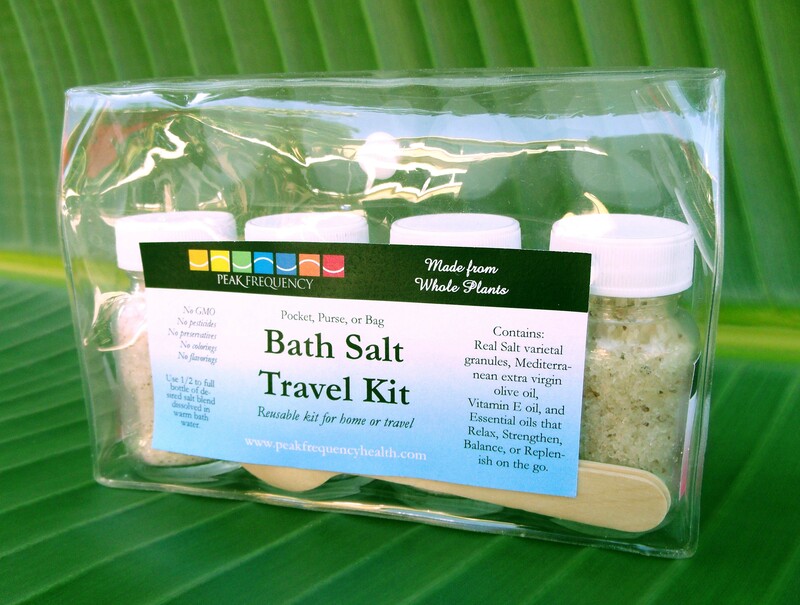 Bath Salt Travel Kit is made for relaxing, stimulating, replenishing, and strengthening while bathing away from home. Its re-seal-able, clear vinyl container fits in pocket, purse, or bag (6x4x2 inches), holds 4 refillable 2 oz. glass bottles, and 3 reusable 1/4 tsp. birch wood spoons. For those on the go this handy Bath Salt Travel Kit is made for relaxing, stimulating, replenishing, and strengthening while bathing away from home. Its re-seal-able, clear vinyl container fits in pocket, purse, or bag (6x4x2 inches), holds 4 refillable 2 oz. glass bottles, and 3 reusable 1/4 tsp. birch wood spoons. Each Bath Salt bottle contains: Kosher, pure, electrolyte rich Real Salt - from an ancient sea bed, blended with moisturizing oils and essential oils that provide skin and body with nutrient rich luxury.